“I had been heavy all my life. I remember being ‘pudgy’ as far back as the 3rd grade. By high school, the extra weight affected my self-esteem and I couldn’t play sports as well as I would have liked to. Through most of my adult life, I struggled with the ‘battle of the bulge’. While in the service and experienced boot camp, I was what I’d consider light, but that lasted only briefly and soon there after, my weight once again had big fluctuations. “Years went by…. I became a father and started my own business. All the while, I continued to gain weight. My feet and knees were always hurting me. That’s what pushed me out of denial. Also, seeing the scale hit 332 pounds was a real eye opener too. That was 1986. It was at that time I found The Healthy Way. Actually, a friend who had been successful on the weight loss program referred me. “I did like they said and followed the weight loss plan. It worked very well and I lost 130 pounds in a little less than a year! Everything was better…my knee and foot pain gone, just moving about in my daily life was so much easier. I hit my goal and felt I had a new lease on life. I figured I had my weight concerns licked, so I didn’t go back for any maintenance instruction or follow up, even though my counselors really encouraged me to do so. “Unfortunately, a couple years later, the big 1989 Loma Prieta earthquake hit and caused a shake up in my life. I started eating more junk again and fell back into old, unhealthy habits. Naturally the weight started coming back on, as did the joint pain and more difficulty just moving around in my body. Ugh…how could I have let this happen to myself?? I was bigger than ever. The scale hit 368, my all time high and I was scared! “Thank goodness I had the sense to return to my friends at The Healthy Way, who welcomed me back with open arms. I told them I now knew what I had done wrong. This time I lost 154 pounds. Boy, it sure feels better to be thinner; I can assure you of that! That was over 15 years ago now and I have been maintaining my weight like a champ ever since!! I guess in total I’ve lost 284 pounds altogether and there is no way I could have done it without the great people at The Healthy Way. They are absolute pros and they make the process kind of fun!! After all these years, I still look forward to my visits with them and now know I’ve conquered my weight issue, thanks to them. “I’m the guy who brings flowers to The Healthy Way, usually every week, because I’m grateful to them for giving me a second chance on life. I check in, visit with my counselor and keep my weight on track. I’ve been doing the Maintenance Program pushing 20 years now and I’ll keep coming, because it works for me. 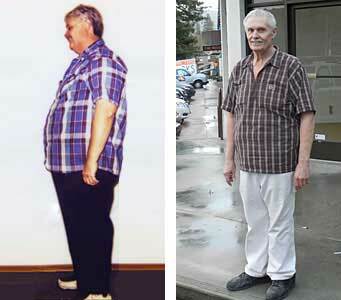 Lost 154 lbs & 152 inches — AND Still maintaining since 1989!